This page contains information on legal protections for carrying and using naloxone, and where to get it. A "standing order" signed in October 2015 allows any Pennsylvanian to fill a prescription for naloxone without first getting a prescription from a doctor. The enactment of ACT 139 - "David's Law"- provides first responders, friends and families access to naloxone, an opioid overdose reversal medicine that will save lives. PA Act 139 and the October 2015 standing order allow individuals to obtain prescription for naloxone, and fill those prescriptions. The Standing Order is a pre-written medication order. The Standing Order allows pharmacies to dispense medication, rather than needing a separate prescription written out to each individual by his/her personal physician for the medication. Various pharmacies may have their own standing orders on file. To use the Standing Order, ask your pharmacist for naloxone. Some pharmacists are not aware of the Standing Order so you may need to explain that one exists and it allows anyone to obtain naloxone. More information about the Standing Order can be found here. Even though all pharmacies can carry naloxone, not all of them do. You may need to educate the pharmacist about the standing order. 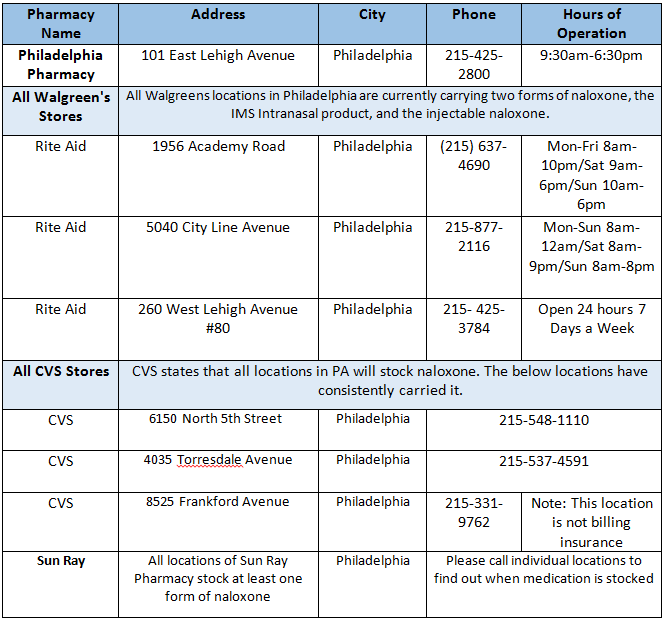 The pharmacies listed below are known to reguarly carry naloxone and to understand the standing order. Medicaid and Medicare programs cover the cost of naloxone with no co-pay. Most private insurance covers naloxone, but the co-pay varies.